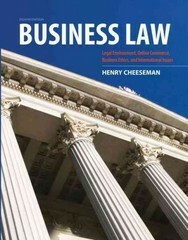 Business Law 8 Edition Visually engaging, enticing and current examples with an overall focus on business. Business Law continues to be the most engaging text for readers by featuring a visually appealing format with enticing and current examples while maintaining its focus on business. Readers will learn business law, ethics, and the legal environment in a way that will encourage them to ask questions and go beyond basic memorization.